Mini pendant lighting is a huge trend for 2015. Most commonly you will see designers use three of the same pendant light across. Some designers have started getting creative and use three of the same light, but may have them in three variants of one color to create an appealing ombre effect. Mini pendant lights are different than a chandelier or larger light in the sense that they are not as bold, but can still be used as a focal point of the room. Many homeowners use mini pendants for functional lighting in a space that needs additional lighting such as over a kitchen island or over a kitchen sink. The pendants not only create additional lighting, but can also serve as a beautiful way to compliment pre-existing lighting. Kichler lighting is known for this type of complementary lighting and has a stunning 2015 collection. 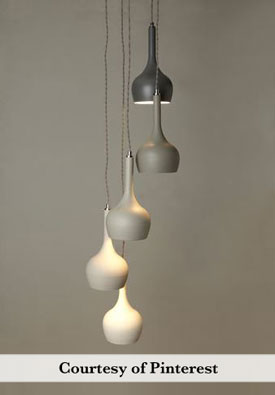 Some designers have taken the mini pendant lighting trend into other living spaces such as the living room. A reading nook is instantly made cozier with a cluster of these trend-setting lights. An ombre effect not only creates visual interest, but also causes the light to be more spread out and subtle. Using incandescent or CFL bulbs will spread this light out even further causing a softer, warmer effect. A final idea for adding mini pendant lighting to your home for 2015 is to use them in the bathroom. This will hands down add personalityto your bathroom. These lights can be added in between vanity mirrors, on either side of a freestanding tub or even on either side of a toilet! Mini pendants are such a fun way to add personality to your home. They also are a functional trend that lends itself to many rooms in a variety of ways. Use just one to accent a focal point, or a cluster of them to add a warm lighting effect.